You must make reservations at least 5 minutes in advance of the time at The Tenderloin Room. **Please be advisedThe parking garage on Maryland Plaza is under construction. There will be limited availability for valet and self parking until further notice. We apologize for any inconvenience. The Tenderloin Room validates valet for a $4 flat rate and up to 3 hours free for self park in the Maryland garage. Closest Metrolink stop Barnes Jewish Hospital which is just south of the Chase Park Plaza. The Tenderloin Room can accomodate up to 125 guests for a larger function. 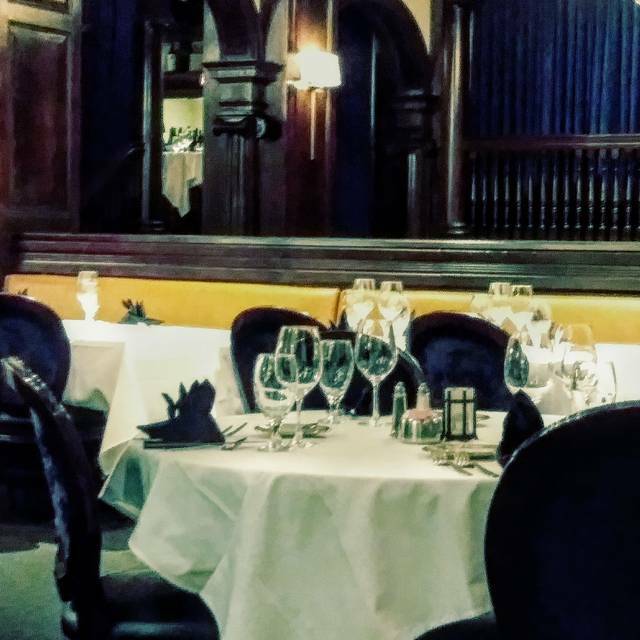 The Tenderloin Room is a St. Louis restaurant legend, known for its traditional entrees and elegance. Located on the first floor of the world-famous Chase Park Plaza, The Tenderloin Room serves gourmet cuisine while producing sensual aromas and the ambiance of romance, business and pleasure. This gourmet steakhouse surpasses the realm of the typical gourmet steak restaurant and triumphs as a paradise for steak aficionados and seafood lovers. Induldge yourself with one of the house specialities, The Pepperloin a la Tenderloin, slices of specially seasoned, marinated tenderloin char-broiled to perfection & served with our famous Tenderloin Room sauce or may we suggest the Rack of Lamb, well-seasoned, grilled and topped with our flavored Greek olive oil. For the Seafood Lovers...Whole Holland Dover Sole,seasoned,broiled and then de-boned tableside or Fresh Salmon, broiled then topped with white wine and caper sauce. One visit to The Tenderloin Room endows memories lasting a lifetime. Everything was wonderful- food was fabulous. First time there and will be back! Best service in the city. Spiro was excellent, and the food is nothing but top quality groceries with a traditional preparation. Don't miss the shrimp and smoked salmon appetizers! The tableside Bananas Foster is a genuine culinary experience. Always a beautiful, old-school treat to visit the Tenderloin Room. Fabulous dinner and our waiter, Nicholas, was amazing! The Tenderloin Room is more than a Restaurant/meal , it’s a destination/experience. Our server, Maxwell, provided outstanding service. He is personal & professional, made our meal perfect. Great to eat in an old-timey "first class" restaurant. The service was impeccable, and the seafood appetizer buffet was also perfect. I especially recommend both the calamari and the shrimp. The meat quality was excellent though my steak-au-poivre, ordered medium rare-to-rare, came closer to medium, a decided shame. I did not complain because I would never waste meat (adding insult to injury to the poor steer!) The crème bulée was up to par with the good stuff, and the cabernet delicious. Overall, it is a lovely place for a special occasion. Uncomfortable leather bench seats- sank in too much. Our entire experience was excellent. The service and food was absolute fabulous. Great evening. Excellent as usual. Spiro gave his well-known outstanding welcome, service, and farewell good wishes. Dinner and service was great!! It was extremely loud, but I don’t fault the restaurant, they just had a few large groups. Have been to the Tenderloin Room many times and it never disappoints. The steaks are wonderful with their special sauce. This time it was a birthday celebration & they provided a card and special birthday desert. The food and service was fantastic. We will definitely go back. The food was good, it’s a shame the experience was overshadowed by extremely rude restaurant management behavior during our after dinner drinks at the lounge. We will never go back and can’t recommend to others when there are so many other good choices nearby. The place offers old school ambiance, wait staff and food. The pepper loin is their signature dish. If you like steak, you will enjoy this place and the presentation. Straightforward, solid dining experience. We really enjoyed our dining experience at The Tenderloin Room. Nicholas was our waiter and did an outstanding job. We had 6:00 pm reservations and were seated in the middle room. As it was not crowded yet, the ambiance was wonderful. It did seem noisy in the first room as it was already full. The food was good, I had the salmon and my husband had the sea bass special. Both dishes were simply cooked but very tasty. Dessert was crème brulee and carrot cake. They were both good but nothing special. It was a very relaxing evening. This is a wonderful experience, from the food to the ambiance to the service. Old world restaurant within a hotel that feels warm and inviting. Great bartender and servers. This was our third visit and we will be back again. We got engaged at the Tenderloin Room on Valentine's Day back in 2001, and have gone there on or close to V-Day every year since, making this the nineteenth consecutive year there. This was one of the lesser visits, as we always order our Pepperloins medium, and this time, they came out rare to medium rare. 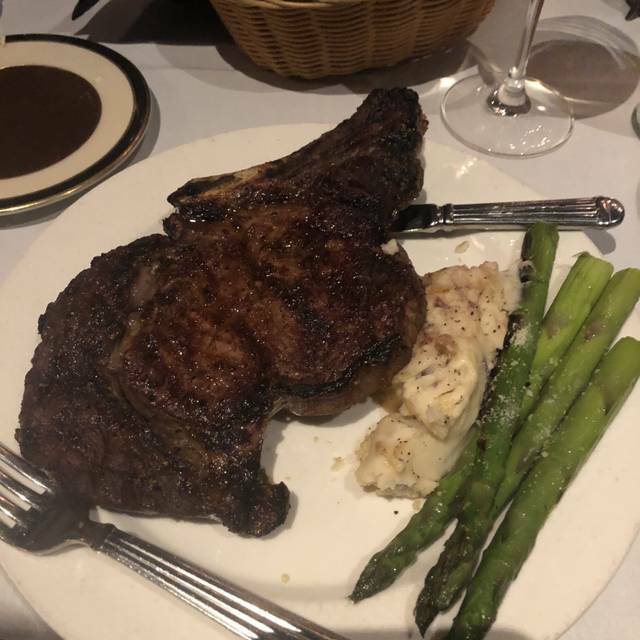 Nevertheless, if you are interested in an old-fashioned high end steak place with a lot of charm, this is a great place. Of course, it is expensive, but you should expect that. it has been awhile since I visited the tenderloin room. last time was valentines day, they had live music. Excellent food. Impeccable service. Always a great experience. One of the best meals I’ve had. Tenderloin was perfect and the bananas foster was amazing. Consistently first class food, service and ambiance. For years we have entertained guests, clients and family at the Tenderloin Room. Have dined at TR multiple times, every time it is a 5-Start experience. Table placement was awkward. There were plenty of available tables yet we were seated partially in a walkway. We were asked for appetizers without seeing a menu. It was over 20 minutes before a menu made it to the table. Cocktails were fantastic. The Tenderloin Room is the perfect place fro celebrate a special Birthday. Our waiter was outstanding. The food was fantastic and my daughter’s Birthday dessert (Bananas Foster) was amazing. More than a meal - an experience! Dinner or lunch The Tenderloin Room never fails to be a special dining experience. Just the fact you’re dining at The Chase Park Plaza is a special event in itself. What a lovely lunch! We had appointments in St. louis all day. So went to lunch at Tenderloin Room for a break. Excellent food and service as always. Lunch portions are a little smaller, but so are prices. Good value. Just wonderful. It's our favorite restaurant. Great food, service and ambiance. Terrific for special occasions or anytime. The food, ambience, and service were all first rate. Our waiter, Ellis was personable as well as professional and efficient. This is a great place for a special occasion. It was our anniversary and we were treated to a card signed by the staff as well as a complimentary dessert. The menu is not large but what the Tenderloin Room does they do very well! CONSISTENTLY GOOD. We frequently enjoy dinner at Tenderloin Room, where the food is good and the service excellent. There are good choices beyond steak, and the flaming desserts are a great show as well as yummy. While the atmosphere is white tablecloth with tuxedo'd servers, it feels special but not "stuffy." A tremendous restaurant. I have been coming for over 35 years. Excellent food,service,ambiance. The "pepperloin a-la-tenderloin" is second to none. The sea food appetizer tray is outstanding. Everything and everyone at the Tenderloin Room exudes class at it very finest. 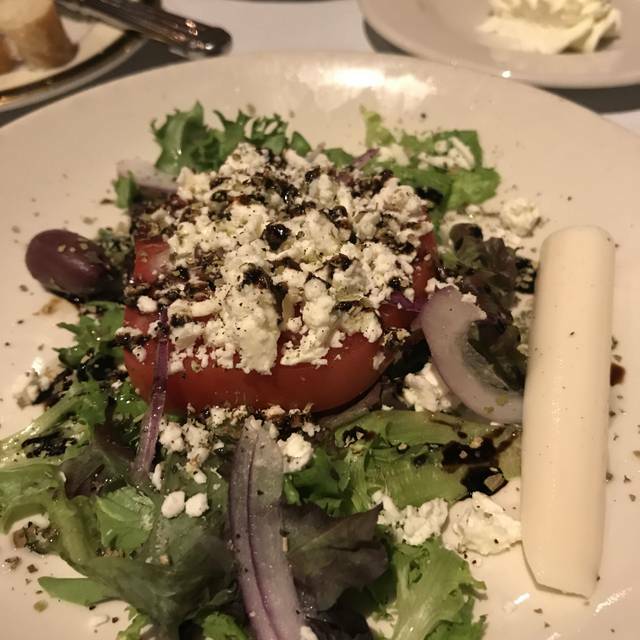 A true "dining experience" that is top-notch for all of St. Louis. Keep up the great work!! BRAVO!!! Always a go to for special occasions or when looking for an extraordinary meal. The service is also outstanding. Although typically expensive it is worth it. A truly elegant steakhouse in a beautiful setting. Impeccable, friendly service. If your cocktail tastes run to classics like the Stinger and the Sidecar, and you still appreciate aged filet mignon cooked rare, you'll feel right at home. Always excellent food and service. Special tableside desserts. Perfect! Only way to describe. Food, atmosphere and service...perfect! Would highly recommend.. Waiter was Spiro, he was fantastic! Wonderful. No noice, wasn’t sure how to interpret rating! ?